With a host of visual changes, the RE Bullet 350 and 500 Trials add an off-road flavour to the standard Bullet range and commemorate the Royal Enfield Bullet Trials motorcycle of 1949. 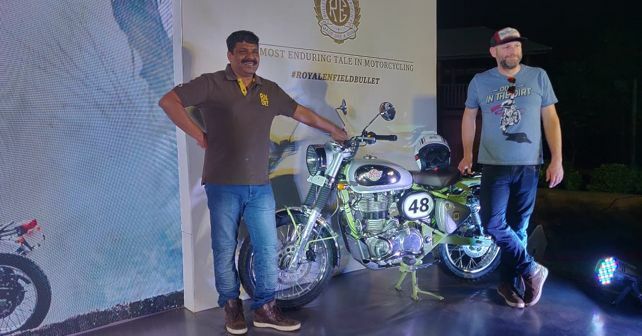 Royal Enfield has added two new models to its Bullet line-up, with the launch of the Bullet Trials 350 and Trials 500. The former has been launched at Rs 1.62 lakh and the latter carries a price tag of Rs 2.07 lakh (all prices are ex-showroom). Both these models are essentially 'Scrambler' versions of the standard Bullet 350 and Bullet 500, meaning that they boast sportier, off-road credentials. Mechanically though, both bikes remain more or less similar to their regular counterparts, as they have the same engines and gearbox as their regular versions. The 346cc engine of the Trials 350 generates 19.7bhp and 28Nm of torque, while the 499cc motor of the Trials 500 makes 27.1bhp and 41.3Nm of torque. The five-speed gearbox in both the bikes remains unchanged too. In keeping with the off-road credentials of the Trials 350 and Trials 500, both bikes feature some distinctive visual changes that easily set them apart from their older counterparts. However, major body panels like the fuel tank and the side panels are, once again, borrowed from the regular bikes. Of all the visual changes, the most striking ones are the coloured frame and the bulky upswept exhaust (practically mounted, though). While the exhaust design remains the same on both, the Trials 350 gets a bright red-painted frame whereas the Trials 500 opts for a more mature green-painted frame. The Trials 350 and 500 also lose the rear pillion seat to make way for a luggage carrier. Further, both bikes get a 19-inch front and an 18-inch rear wheel shod with dual-purpose tyres with block tread pattern for improved off-road grip. The stopping power comes from a single disc on both wheels (280mm at the front and 240mm at the rear) but with dual-channel ABS. To accommodate the chunky tyres, the fenders have been raised slightly. For enhanced stability, the handlebar has been reinforced with cross-brace. Bookings for both bikes are officially open at all Royal Enfield dealerships across the country.